It had been a slow day at work, so my curiosity got the better of me. Looking left and right to make sure nobody was watching me, I took the heavy box up in my arms like a lost kitten and scurried gleefully back to my desk. Inside the box could be anything! Russian nuclear codes, depleted uranium, a punch-card program for listing the prime numbers between 1 and 10,000, Jimmy Hoffa...the possibilities were endless. I tried to flip open the latches, only to find that they were locked! Whatever was in this box, somebody did NOT want it to get out. My pocket knife easily thwarted the rusted locks. I threw open the box and looked inside to see the treasure contained within. Looking back at me was a true abomination. Had it not been worn away from years of being held in a substandard storage facility, my eyes might have melted away the moment this aberration of nature slipped into my field of view. What was it that caused such a reaction? 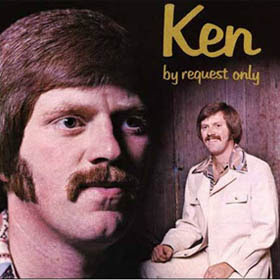 Why, it was nothing less than a copy of "Ken--By Request Only". Against my better judgment, I'm placing a copy of the album cover below. It's only a stock photo copy, not a direct scan, so it should be safe. Still, don't look directly at it or your retinas may explode. Back in the 1970's, a combined task force from the CIA, FBI and the Army Corps of Engineers were researching non-lethal weapon technology that could be used to subdue an enemy in order to take them into custody and question them. They hit upon a dual-sensory approach that would offend both the eyes and the ears of an enemy combatant. In order to achieve this objective, project scientists decided to clone Sister Sledge. They then inverted her genetic structure and mutilated one of her X chromosomes, turning it into a Y. The result was Ken. Age acceleration technology and bio-encoded memory engrams brought him up-to-speed for his task within a mere 18 months of emerging from the cloning chamber. 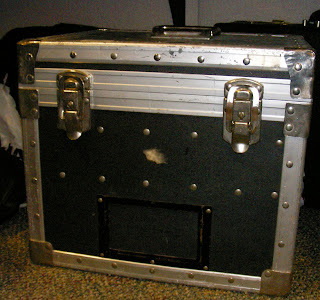 He then recorded an album, the result of which would be the non-lethal weapon that the project leaders had long sought. But it worked too well. Instead of immobilizing enemies with uncontrollable diarrhea, vomiting, migraines and intense eye irritation, it made them die a horrible, agonizing death. Copies of the album had been intended to be dropped on Argentinians occupying the Falkland Islands in 1982. Due to the fatalities that ensued from field testing, however, the project had to be scrapped. Copies of the album that could not be destroyed were packed up and shipped to isolated locations throughout the United States. I ran screaming from my office, hoping to find my way to a bathroom sink so that I could wash my eyes out, lest I be subjected to a long absence from work. When I returned, the album was gone. Someone had run off with it. Woe be unto me, for I have let this scourge loose upon the world. All I can say is that I am sorry. Cover your ears and avert your eyes. The Virtual Sink's 198th Post SPECTACULAR!!!! Murder Or A Heart Attack? Samuel Adams Makes With The Swag!